This work is based on the documentation and transformation of art work created from 1979-2007. During this time the work has undergone over thirty-five disposals. Labeled as “art disposals” in 1992, these actions and performances began as a way to clean the studio and get rid of unsuccessful works in order to make room for the new. “Burial” in 1988, marks the beginning of this process where thirty works were removed from the studio and buried in a six foot deep hole. This alternative process-transition has utilized a variety of techniques which include: flambé, explosions, drowning, chemical contamination, flash gunpowder, burning, cutting, freezing, shredding, hanging, aerial ascent, bad reviews, bad student drawings, destruction by auction, natural disaster, etc. In the beginning, the disposal process was intended to completely destroy these unwanted works. 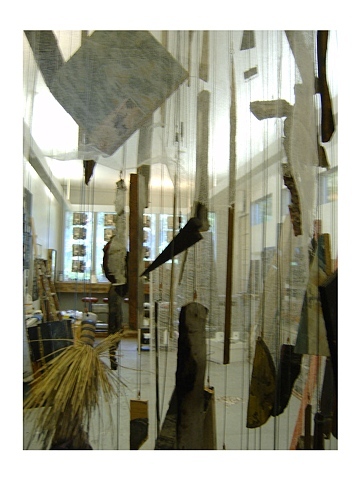 Gradually, over time the remains of the destroyed art work was utilized in the making of the “new work”. This transitional new work has little to do with art as an object. It is about the continuous transition of work whose final outcome is in constant flux. The commitment to making this work reflects the reality of our own changing lives. There is NOTHING that remains static, with constant change occurring day to day and minute to minute. What we are left with is the experience and memories of each episode of our lives.